Few places in Greece, the Aegean, or even Lesvos, have this kind of view, the tiny picturesque fishing harbour to the left, and then across the straits of Toukmakia to the purple hills of Turkey. 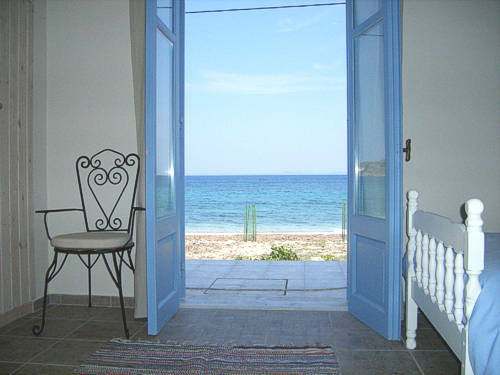 Just open the door and walk straight out on to the beach at magical Skala Mystegna. 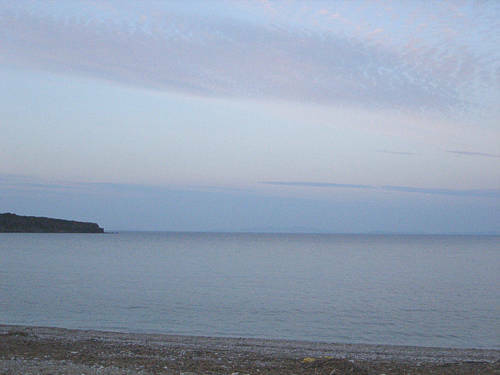 And what a beach it is - the beautiful white pebbles, truly crystal blue waters of the Aegean, without the crowds. This idyllic holiday destination is perfect for those seeking peace and seclusion, or 'to get away from it all'. Even in high season the beach remains low key and sparsely populated. There are three tavernas and one cafenion close by, (at least one of these establishments is guaranteed to be open year round). We do recommend car hire to our guests, to give quicker access to other amenities close by: if you would like assistance in this matter please ask us. 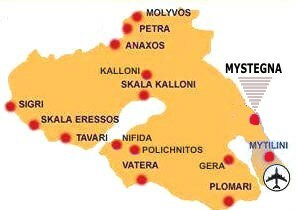 Mystegna is the 'partner' village of Skala, located a couple of kilometres inland, just a few minute's drive away/twenty minutes by foot. The village oozes sleepy charm. 'Partner' or 'twin' villages are not infrequent in Lesvos, the reasons for their evolution is a subject for some conjecture. 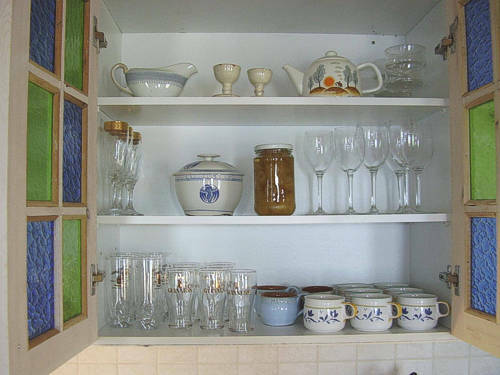 One theory involves the historic habit of fisherfolk leaving their seaside villages at the end of the summer, and establishing second homes some distance inland, better to protect themselves from the bitter winter weather on the coast. Another theory harks back to the days of piracy (until the late 16th C), when the people reacted to the losses suffered at the hands of marauding gangs, by establishing these second settlements inland, away from harm. 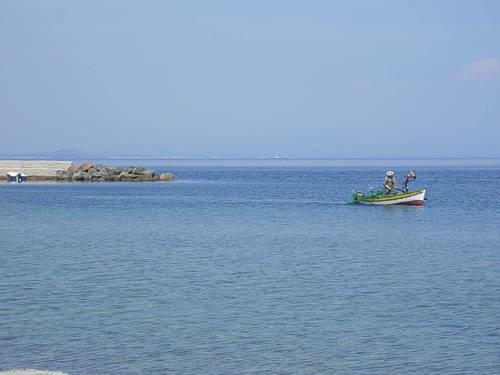 Panayiouda is a fishing harbour less a 15 minute drive south. 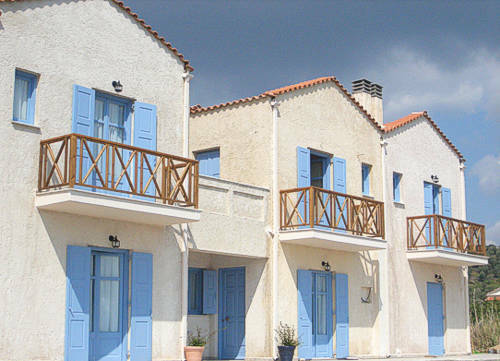 Here the sea front is lined with restaurants and tavernas, renowned for their quality of fish and traditional dishes. And only a ten minutes drive from the Kyparissis Beach Houses is Thermi one of the unique locations of thermal springs on the island (open mainly for the summer season). The waters are hot, mineral laden and said to have extensive therapeutic qualities, especially for those suffering from bone or muscle problems. A slightly more sophisticated thermal bath house (or hamam) is located at Therma, located on the Gulf of Gera (approximately 20 minutes by car). Here, not only can you soak away your aches and pains in the thermal pool, but also partake in relaxing therapeutic activities (including mud baths) by a registered masseuse specializing in holistic massage and Reiki, Thai massage and aromatherapy. (open year round)! Moria is a beautiful little village accessible by car (10 minutes) renowned for the fine example of Roman aqueduct which straddles a valley filled with olive trees. A magical place to visit. And further a field is the mountain town of Mandamados with its famous monastery, distinctive ceramics and excellent yoghurt and cheese. MytileneYou're also only twenty minute drive from Mytilene the capital of Lesvos, where is the sea port and Airport is, and a sophisticated city with lots to do, day and night, outstanding sight-seeing, cultural attractions (castles, museums, kafeneon), shopping or night life (hot bars or authentic traditional bouzoukia). The island of Lesvos is well known in international bird watching circles, lying as it is on the migratory routes of many unusual and interesting species. From Mystegna access to the major sites can be attained quite easily by car. Heading north from the property the coastal road offers breathtaking views across the channel to Turkey, which at some points is less than 9 kilometres away. Day trips can be taken to the northern resort towns of Molyvos (with its fine Byzantine castle) and Petra (historic church perched high on a rock). It is also possible to take the short drive to Mytilene one morning, board a ferry and visit Turkey (crossing is only one and half hours); marvellous shopping opportunities in the shops and bazaars of Ayvalik. There are stunning walks around the coast and hills. And of course; the whole island which many people say is like the whole of Greece in miniature. July and August are the high season, so, if you want to be alone, the rest of the year can be yours.